Get ready for summer at your static caravan or holiday lodge with our gear guide on gas barbecues. 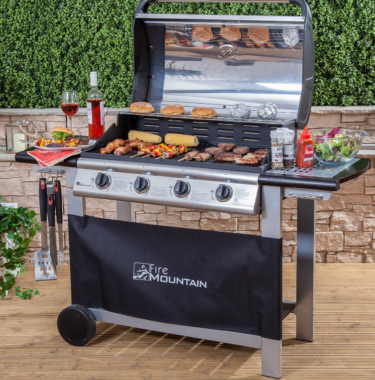 We go through the key features to look for when buying a barbecue, safety tips when cooking outdoors, plus five great gas barbecues that are great for grilling on a veranda or patio. Before cranking up the gas outside, always check that your park owner is happy for you to use a barbecue. Plus, spare a thought for your fellow neighbours who might not appreciate the smoke and smell! Keep your barbecue away from children playing and remember, a barbecue can give off a lot of heat so don’t have it too close to your static caravan or lodge or near any veranda rails and posts. It could cause serious damage or scorching. Also, keep it well off the ground to prevent scorching or burning. Never cook in an enclosed space and never take your barbecue indoors. Keep a fire extinguisher or an electric blanket nearby – just in case of emergencies. On a windy day try to cook in a sheltered area or use a barbecue with a hood to act as a windbreak. As well as safety, hygiene is just as important whenever you’re preparing food. Keep your cooking utensils clean and don’t mix cooked and raw ingredients. Always keep the right foods at the right temperatures. Use separate chopping boards and knives for fresh meat, cooked meat and vegetables, to prevent any cross-contamination. Brushing meat with vegetable oil will help to stop it sticking to the grill. Add a bit of Rosemary to keep the bugs away too. Marinating meats overnight in a sealed plastic bag means you can agitate them occasionally for an even covering – fish should only be marinated for 20 minutes, however, before the marinade begins to “cook” the flesh. Whilst cooking over charcoal might give you a better flavour you can’t beat a gas barbecue for the instant heat so you can get cooking straight away. 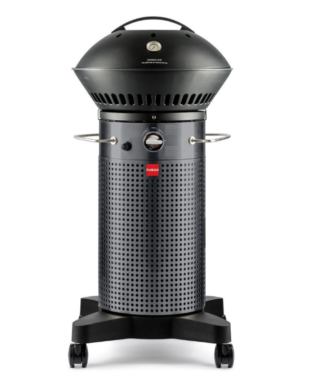 Plus, many gas barbecues now come with a range of extra burners and features for the ultimate outdoor cooking party! First of all, consider how much space you have on your veranda or patio and where you can store it when it’s not in use. Some will have side trays and legs which fold down, or alternatively you can keep outside by investing in a cover. Just make sure it’s not going to be left out during stormy weather. 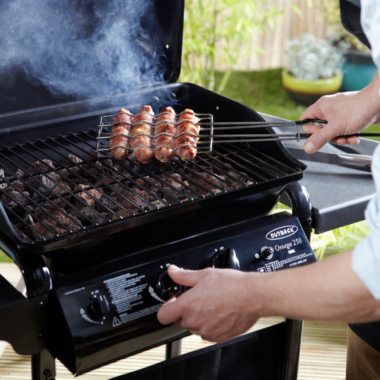 The “wobble test” (giving it a gentle shake) will help you find out how sturdy the barbecue is and it might be worth looking for a gas barbecue with locking wheels for extra stability. Depending how many people you’re cooking for will determine how many burners you’ll need and the size of your cooking area. Also the style of barbecue all depends on how you plan to cook on it. Some will have a standard cooking grate for traditional grilling but then there are some which will also include hot plates, griddles and separate side burners/hobs for warming sauces, steaming, etc. The more features, the more adventurous you can be with your cooking, with the option to grill, roast and even bake! Different cooking surfaces, such as a griddle will also be easier to clean, and look out for fat collectors too ease the dirty work after cooking. Outdoor cooking on a gas barbecue is not complete without utensils, sauces and spices. So be sure to look for a barbecue that gives you a place to hang your burger flipper and sausage fork, plus shelving for condiments. The cost of a gas barbecue can range from around £100 to well over a £1,000, dependent on brand, size and those all important features. Let’s take a look at five gas barbecues, from budget, to cool and super-sized! This four burner gas barbecue has a large cooking area and is sturdy enough to cater for a small family or barbecue party. The removable drip tray and griddle will make cleaning easy and you’ll have plenty of room with a large 77cm (W) x 42 cm (D) cooking area. There’s a built-in temperature gauge and with wire warming rack inside the large hood, you can keep food warm so you can stay eating outdoors for longer. There are also two handy side shelves, plus those all important bars to hang utensils on and a hook for a cooking glove. 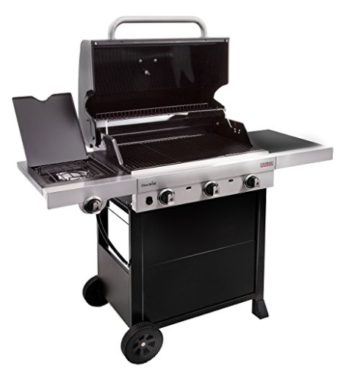 Key features: Cast iron burners, stainless steel hood, piezo ignition, warming rack and built-in temperature gauge. Two wheels to make it easy move around and store away. Dimensions: 140cm (W) x 106cm (H) x 56cm (D). If you wanting a sleek and cool looking barbecue then look no further than the Fuego Element – the brainchild of Apple’s former chief of design and claiming to be like no other grill on the market. It’s certainly compact, but perfect if you’re short on space, measuring 53x53cm, complete with space underneath for a 5kg gas cylinder. Plus it’s very portable with four casters. It has two stainless steel burners which produce some serious heat for serious grilling on its porcelain enamel cast iron grate! Key features: Easy to clean residue tray, electronic ignition and heat reflective lid. Quick assembly time with 14 screws. 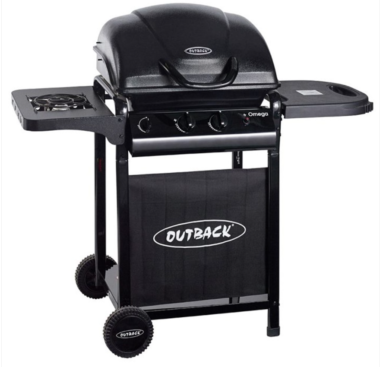 This entry-level gas barbecue from popular brandname Outback, is great if you’re not wanting to spend too much but want the ability to barbecue on your caravan holidays. It has two burners, plus a handy side burner for frying or boiling and a folding side shelf with tool holder and a good sized cooking area to comfortably feed a family of four at 50cm x 36cm. Overall dimensions are 103 x 49 x 113 (H x W x L). The Outback Omega uses lava rocks over the two burners, allowing heat to distribute evenly across the chrome cooking grill and to give a more unique barbecued flavour when fat or water drip on to them. Key features: Piezo ignition, pre-assembled roasting hood, bottom shelf, dual control burner, free gas regulator and two rubber wheels. Char-Broil is a big US brand and this gas barbecue uses their TRU-Infrared cooking system, which promises to cook food evenly, making it super juicy, without any flare ups. Plus it’s supposed to use up to 30 per cent less gas. The three burner, Performance 330B has enamelled steel grates – providing up more than 50 cm of cooking space – which should also be easy to clean. Key features: Stainless steel burners, two large wheels for easy mobility, Surefire® Electronic ignition, warming rack, side burner with drop down lid. 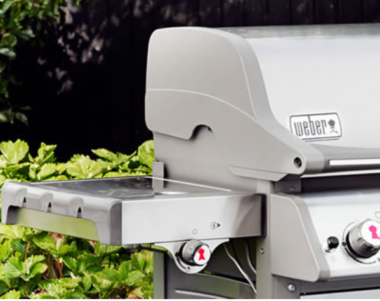 If you’re an expert on an outdoor grill then you’ll love this gas barbecue from prestigious, worldwide, brand Weber. It not only looks great it also has a range of innovative features, which promise exceptional flavour as well as bags of practicality. 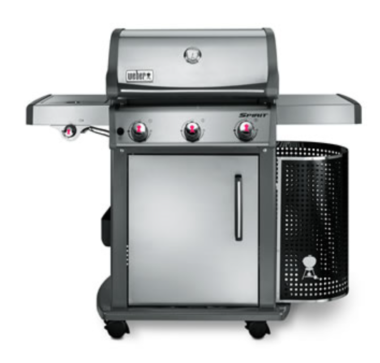 The Weber Spirit Premium S320 has three stainless steel burners and cooking area which measures a mighty 61cm x 45cm. The Gourmet BBQ System includes a 30cm middle grate which can be lifted out and replaced with a number of accessories, such as a wok, pizza stone, roaster or dutch oven for a multitude of cooking options. Then there are their “Flavorizer bars” to give that extra smokey flavour when cooking juices fall onto them and the electronic Crossover Ignition System will fire up all the burners together. These burners can also be regulated for direct grilling or if you want to have a go at roasting or baking. There’s also a handy side burner and side table. It’s all very stylish with a neat gas bottle cover at the side – to fit a 13kg bottle and handy storage cupboard below. Key features: Built in thermometer, warming rack, stainless steel cupboard door for 5kg gas bottle and accessories, disposable drip tray, six tool holders and condiment rack. Want to tell us about your BBQ? Got any gas barbecue buying or cooking tips to share. Feel free to add your comments to below.